Alright guys, I know I’m not reinventing the wheel here. But I’m often asked for this recipe, and it’s pretty fool-proof, so I thought I’d share it and settle this for once and for all. But first, here’s my ultimate time-saving tip: When you have bananas that are well-ripened, looking more brown than yellow, and you’re in denial about still eating them, put them in the freezer. This will put your mind at ease and they will keep for months. I first used this recipe almost a decade ago, but have changed it slightly over the years to reduce the sugar and fat content and it always turns out great. I mainly cut back on the butter and instead add a little yogurt and extra banana to keep it from being dry. I like a bit of texture in my bread, so I almost always add the coconut, walnuts and flax seeds. Feel free to experiment with other additions you may like, such as sunflower seeds or craisins. Cream sugar and butter; beat in the mashed bananas, eggs, and vanilla. Combine dry ingredients and stir into the first mixture just until moistened. Fold in chocolate chips (and coconut, nuts, etc if you are using them) until well incorporated. Pour batter into greased and floured 9x5x3-inch loaf pan. Cover loosely with a tent of aluminum foil (very important so that it stays moist and doesn’t burn the top!). Bake at 325° for 30 minutes. Remove foil and continue baking for 40-45 minutes or until wooden pick inserted tests done. 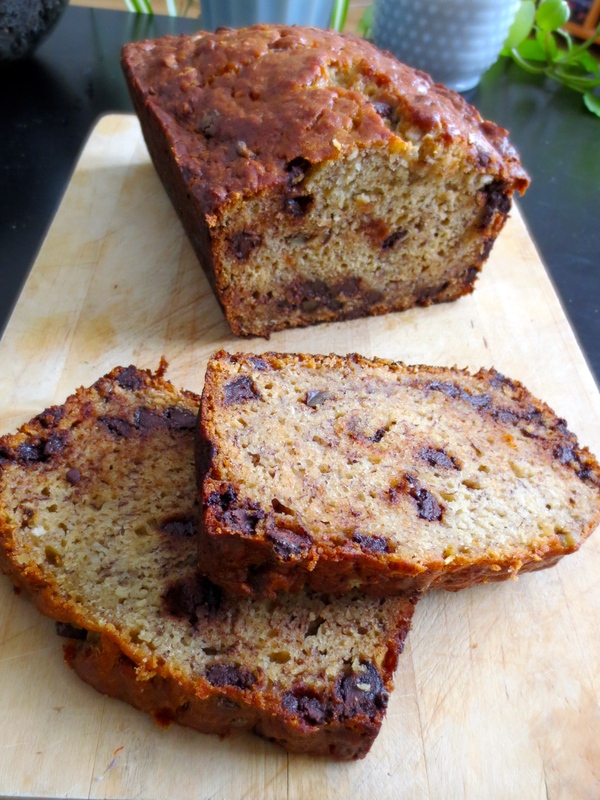 Cool for 10 minutes, remove from pan and cool banana bread completely before slicing.